Restored native prairie surrounds the 2007 LEED-certified library addition. Malinda E. Berry, Ph.D., Assistant Professor of Theology and Ethics, teaches a Church and Race course in September 2014. Anabaptist Mennonite Biblical Seminary (AMBS), Elkhart, Indiana, USA is a continuation of Associated Mennonite Biblical Seminary, which grew out of a history of collaboration in Mennonite theological education. A partnership called the Associated Mennonite Biblical Seminaries began in 1958 when Mennonite Biblical Seminary (MBS), sponsored by the General Conference Mennonite Church, moved to Elkhart from Chicago to locate near Goshen Biblical Seminary at Goshen College, which was sponsored by the Mennonite Church. In 1969, Goshen Biblical Seminary moved to the Elkhart campus, marking an increase in collaboration that eventually resulted in a joint curriculum and faculty. Marlin Miller, who became president of Goshen Biblical Seminary in 1975, was also named president of Mennonite Biblical Seminary in 1990. In 1993-94, the two seminaries formally merged and were incorporated as Associated Mennonite Biblical Seminary. Following the merger of the General Conference Mennonite Church and Mennonite Church which led to the formation of Mennonite Church Canada and Mennonite Church USA, AMBS remained the seminary of both denominations. AMBS has always been open to students who were not affiliated with its sponsoring denominations. For many years, the seminary served regional United Methodist students. Beginning in 2003, the seminary made conscious efforts to serve students who identified with aspects of Anabaptist theology but are not part of one of the sponsoring denominations. In 2018-19, 43% of students were from denominations other than Mennonite Church USA and Mennonite Church Canada, many of them from congregations/regional bodies that were part of Mennonite World Conference. In 2019, the seminary offered the Master of Divinity, Master of Arts: Theology and Peace Studies, and Master of Arts in Christian Formation, all accredited by the Association of Theological Schools (ATS). The Master of Divinity degree was offered in two delivery modes, Campus and Connect. The Connect program could be completed through online coursework with a series of week-long intensive sessions on campus. Beginning in 2019-20, it was anticipated a Master of Arts: Theology and Global Anabaptism would also be offered (pending ATS Commission approval, expected in May 2019). The seminary offered a Graduate Certificate in Theological Studies, which could be completed fully online or on campus. In 2019, ten persons served on the AMBS teaching faculty. The 2018-19 first-semester degree program enrollment was 98. In 2000, AMBS launched the Church Leadership Center, administratively consolidating previous efforts at Pastoral Studies Distance Education, Conference Based Theological Education, and Continuing Education. In 2019, the Church Leadership Center offered a variety of lifelong learning opportunities for Christian leaders, including six-week online non credit short courses, the Journey Missional Leadership Development Program, and an annual Pastors and Leaders conference. The seminary’s Center for Faith Formation and Culture offered !Explore, a theological education program for high school youth. In 2018, AMBS received $1 million from Lilly Endowment Inc.’s Thriving in Ministry to help establish Thriving on the Journey: A Process for Pastoral Leaders. 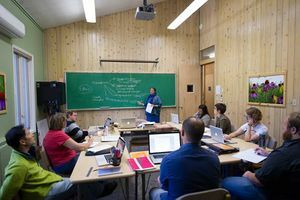 Begun as part of the original Associated Seminaries partnership in 1958, the Institute of Mennonite Studies (IMS) has published Mennonite theological scholarship and hosted conferences. IMS co-publishes Vision: A Journal for Church and Theology with the Centre for Faith and Life at Canadian Mennonite University (Winnipeg, Manitoba). Together with Mennonite Central Committee U.S. and Canada, Mennonite Church Canada, and Mennonite Mission Network, AMBS has published the journal Anabaptist Witness, which continued the prior publication Mission Focus. AMBS partnered with Goshen College and the Mennonite Historical Society (Goshen, Indiana, USA) to publish Mennonite Quarterly Review. Goshen College and AMBS have co-sponsored the Mennonite Historical Library at Goshen College. In 2007, the seminary opened a new library, which received a Leadership in Energy and Environmental Design (LEED) Gold rating for its attention to ecological sustainability in construction. In 2019, the library held over 100,000 print volumes and subscribed to numerous electronic resources. It also promoted open-access digital resources, such as historic Mennonite periodicals and scholarship produced by persons connected with the seminary. Following years of allegations of sexual violence committed by former professor and Goshen Biblical Seminary President John Howard Yoder, AMBS hosted a March 2015 event to acknowledge Yoder’s victims and issue an apology. AMBS also supported Rachel Waltner Goossen’s research into Mennonite leaders’ incomplete responses to Yoder’s abuse, published in Mennonite Quarterly Review in January 2015. AMBS had women on the teaching faculty from 1958 on, with Bertha Harder in a pioneering role, and in key administrative leadership roles from 1990, with Gayle Gerber Koontz as academic dean. Women enrolled in both Mennonite Biblical Seminary and Goshen Biblical Seminary beginning in the 1950s. Though enrollment has fluctuated from year to year, AMBS enrolled roughly equal numbers of men and women between 2013 and 2018. AMBS made a commitment to creation care with the 2006-07 library construction process; this had an ongoing influence on the seminary’s decisions about building projects and grounds maintenance and on seminary course offerings and community life. In 2019, AMBS offered an Environmental Sustainability Leadership concentration in its MATPS and MDiv programs through a partnership with Goshen College’s Merry Lea Environmental Learning Center. AMBS was a member of the Seminary Stewardship Alliance from 2013-18 and joined the Green Seminary Initiative in 2018. AMBS hosted the Rooted and Grounded Conference on Land and Christian Discipleship four times between 2014 and 2018. AMBS began its anti-racism efforts in 1995. AMBS efforts have combined interpersonal and systemic approaches, facilitating training and educational events and working to change seminary policies and procedures. As of 2019, AMBS has an Intercultural Competence and Undoing Racism (ICUR) team composed of administrators, teaching faculty, staff, and students. Through the ICUR team, AMBS students and employees have completed the Intercultural Development Inventory (IDI) and received anti-racism training. The ICUR team has worked to change policies and procedures, such as the grievance policy, to increase fairness. In the 2018-19 academic year, about one-fifth of AMBS students were from countries other than the USA and Canada and about 12% of employees were from underrepresented racial-ethnic groups, including teaching faculty members and key administrators. Anabaptist Mennonite Biblical Seminary. “History of Anabaptist Mennonite Biblical Seminary.” Accessed 13 March 2019. http://www.ambs.edu/about/history. Dyck, Cornelius J. The AMBS Story. Elkhart, Indiana: Associated Mennonite Biblical Seminary, 1997. Pannabecker, Samuel Floyd. Ventures of Faith: The Story of Mennonite Biblical Seminary. Elkhart, Indiana: Mennonite Biblical Seminary, 1975. By Harold S. Bender. Copied by permission of Herald Press, Harrisonburg, Virginia, from Mennonite Encyclopedia, Vol. 4, p. 1060. All rights reserved. Beginning with the academic year 1958-59 the Mennonite Biblical Seminary of Elkhart, Indiana, and the Goshen College Biblical Seminary of Goshen, Indiana, entered a cooperative relationship known under the descriptive name, The Associated Mennonite Biblical Seminaries (AMBS). By action of the boards of control of the two seminaries, following a Memorandum of Agreement defining and regulating the relationship, a plan of academic cooperation had been set up which provided certain substantial advantages for both schools, while retaining the academic, organizational, and financial independence of each. 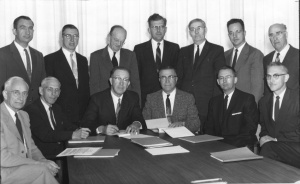 Provision was made for later adherence of other Mennonite bodies to the Association, and at the time it was hoped that the Association might ultimately become a general center of ministerial and missionary training for the Mennonite brotherhood of North America. The headquarters of the Association were placed on the Elkhart campus. An Institute for Mennonite Studies, also located on the same campus, was established as a conjoint operation of the Associated Seminaries. The following joint committees directed and served the co-operative program: (a) the Joint Coordinating Committee representing the boards of control, functioning for the general supervision of the cooperation; (b) the Joint Administrative Committee representing the seminaries, composed of the president and dean of each associated seminary, and one representative of each affiliated seminary, to be administratively responsible for the day-to-day functioning of the cooperative program; (c) the Joint Library Committee, responsible for the co-ordination of the library program by which the libraries of the two schools function as an operating unit. In addition to the regular offerings by each seminary of its own required and elective courses, the Associated Seminaries provided a program of joint-course offerings, to be normally given on the Elkhart campus, sufficient to make it possible for a student to take one fourth to one third of his or her curriculum choices in the conjoint program. In addition, cross-registration by students in the regular offerings of all associated seminaries was permitted by consent of the deans involved. Stutzman, Karl. "Anabaptist Mennonite Biblical Seminary (Elkhart, Indiana, USA)." Global Anabaptist Mennonite Encyclopedia Online. March 2019. Web. 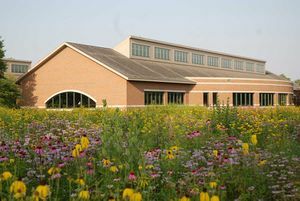 23 Apr 2019. http://gameo.org/index.php?title=Anabaptist_Mennonite_Biblical_Seminary_(Elkhart,_Indiana,_USA)&oldid=163778. Stutzman, Karl. (March 2019). Anabaptist Mennonite Biblical Seminary (Elkhart, Indiana, USA). Global Anabaptist Mennonite Encyclopedia Online. Retrieved 23 April 2019, from http://gameo.org/index.php?title=Anabaptist_Mennonite_Biblical_Seminary_(Elkhart,_Indiana,_USA)&oldid=163778.